In this post we will explore Spring @Profile annotation and use it to make different set of beans or configuration available conditionally on different environments. We will also discuss corresponding XML based profile configuration for comparison. Let’s imagine you have an application which includes database-interaction. You might want to configure one dataSource (for MySQL e.g.) for Development environment while completely different dataSource (for ORACLE e.g.) for Production. 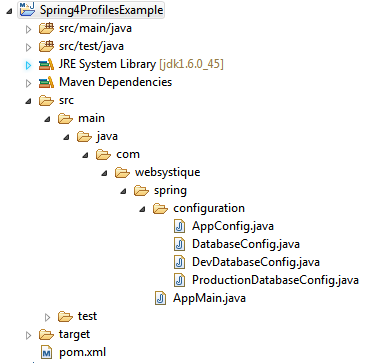 Using Spring Profiles, you can easily manage such setup. We will explore this example use-case in this post. Above Configuration just have one property to be auto-wired. Now what we will show here is that this dataSource bean can be injected with different beans on different environment (MySQL dataSource on Development & ORACLE for Production e.g.). Simple Interface to be implemented by all possible environment configurations. Both DevDatabaseConfig and ProductionDatabaseConfig are simple configuration classes implementing DatabaseConfig interface. What special about these classes are that they are annotated with @Profile annotation. Based on your environment you will provide the value of profile, and the beans dependent on that profile will be registered in Spring container. Notice how we have set the active profiles to be used on runtime. context.scan("package") scans the mentioned package and registers all the @Component but when it encounters the @Profile annotation on a bean/configuration, it compare the profile value with the one supplied in environment. If the value mathces, it registers that bean else it skips it. In our case it’s the DevDatabaseConfig dataDource which will be injected in AppConfig.dataSource. Based on actual profile in use, corresponding config-context.xml file will be loaded, other one will be ignored. Run it. You will see the same output as with Annotation based setup.